Published on 10 February, 2010 in FOSS. 13 Comments Tags: desktop, environment, gnome, kde. The sleek modern desktop environment from KDE SC has finally arrived. I’ve been waiting a long time for a solid, complete version and now I can finally delve right in and see all the goodies that KDE has to offer (although 4.3.5 was also very good, in my mind 4.4 is “it” and marks a most important turning point in the desktop). Update: Renamed the title of the post so as to not appear to be dissing GNOME (which is also a brilliant desktop). Published on 22 January, 2010 in FOSS. 0 Comments Tags: adoption, desktop, Linux, munich, odf. I missed this previously, but Munich has finally switched over to exclusive use of ODF for documents, and PDF for non-editable documents. 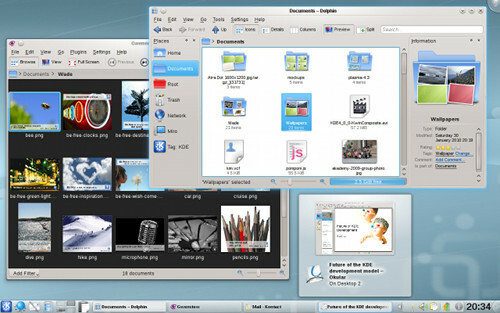 The city administration’s standard desktops now consist of the free OpenOffice.org office suite, Mozilla’s Firefox browser, the Thunderbird email client and several other open source applications, such as the GIMP image editor. 10% global desktop market share for GNOME this year? Published on 5 January, 2010 in Tech. 3 Comments Tags: desktop, gnome, Linux. Will we see Jeff’s dream of a 10% desktop market share for GNOME this year? Published on 14 December, 2009 in FOSS. 0 Comments Tags: desktop, mandriva, nepomuk, semantic. KDE News provides a first look at Mandriva’s integration of Nepomuk with KDE 4.3 in their recent release. A friendly Nepomuk based search interface is expected to debut with Dolphin in release 4.4 of the KDE Software Compilation and full browsing capabilities based on Nepomuk are aimed for inclusion in 4.5 in the form of faceted browsing. Published on 4 June, 2009 in FOSS. 2 Comments Tags: desktop, gnome, kde, Linux, magazine. I’ve just finished my second article for Linux Magazine, on whether KDE 4 is complete enough or not. Feed back welcome. The Just another Linux geek archives for the desktop tag.